From Establishment To Tea Party, Republicans Rebut President : It's All Politics Washington Rep. Cathy McMorris Rodgers, who delivered the official GOP response Tuesday evening, didn't have the spotlight to herself — there were also three other Republican rebuttals. Rep. Cathy McMorris Rodgers, R-Wash., rehearses the GOP response to the State of the Union on Capitol Hill. She delivered it Tuesday following the president's speech. 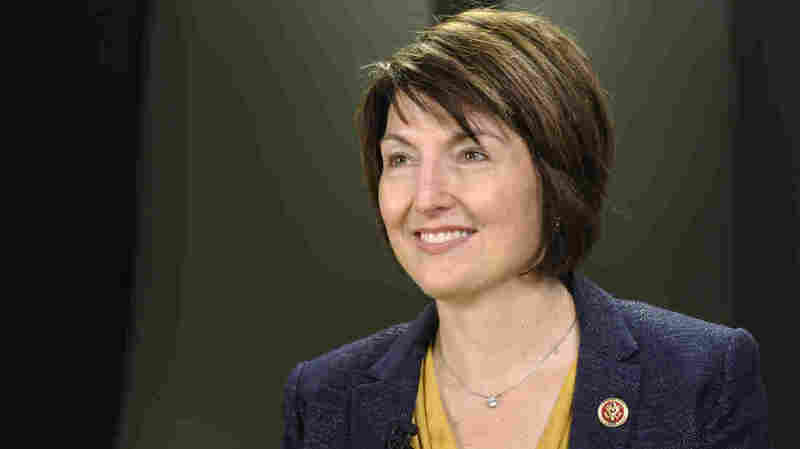 Cathy McMorris Rodgers, the highest-ranking female Republican in the U.S. House, occupied a coveted spot Tuesday night: She delivered the televised rebuttal to the president's State of the Union. Yet the Washington congresswoman and mother of three young children didn't have the spotlight to herself. She faced competition from within the ranks of her own party, a stark reflection of the divisions that have riven the GOP. After McMorris Rodgers, who's in her fifth House term, delivered a modest and measured call for "a more hopeful Republican vision," infusing her address with family and a call for "guidance from God," Sen. Mike Lee of Utah gave the Tea Party response that called for turning protest into reform. Then there was Sen. Rand Paul of Kentucky, positioning for a potential 2016 presidential run, who offered up his own anti-establishment, small-government rebuttal. The schedule wasn't as overloaded as back in 1968, when 16 Republicans officially weighed in after President Lyndon Johnson's State of the Union. But the message the official wing of the GOP attempted to send by highlighting a prominent woman was decidedly diluted. "The most important moments right now aren't happening here," she said from her hideaway office on Capitol Hill, seated on a formal gold couch next to a fireplace. "They're not in the Oval Office or in the House chamber. They're in your homes." "Kissing your kids goodnight. Figuring out how to pay the bills. Getting ready for tomorrow's doctor's visits," said McMorris Rodgers, the first in her family to graduate from college. The congresswoman criticized Obama's health care law, which she has voted to repeal and defund, and spoke about insurance cancellation notices received by constituents. But she also said this: "No, we shouldn't go back to the way things were, but the president's health care law is not working. Republicans believe health care choices should be yours, not the government's." "And that whether you're a boy with Down syndrome, or a woman with breast cancer, you can find coverage and a doctor who will treat you," she said. Her son Cole was born in 2007 with Down syndrome, and her relationship with him was featured in a biographical video released last week by Republicans — he was the emotional center of her address Tuesday. "I'm a better legislator, a better person," she said in the video, because of her son. During her speech, she said that when she and her husband "looked at our son, we saw only possibilities. We saw a gift from God." "We are not defined by our limits, but by our potential," she said, segueing from her son's accomplishments — reading at grade level, dancing to Bruce Springsteen — to Republican efforts on behalf of Americans beset by "opportunity inequality." She outlined what she characterized as GOP plans to "close the gap." "If we're successful, years from now our children will say we built the American dream," she said, whether it's a girl from Kettle Falls or a boy from Brooklyn. "The true state of the union lies in your heart, and in your home." The official rebuttal was also delivered in Spanish by Florida Rep. Ileana Ros-Lehtinen. Meanwhile, the alternative Republican responders — Lee and Paul — served up some spicier fare, though perhaps not as overtly assertive as the three previous Tea Party rebuttals delivered by Rep. Michele Bachmann of Minnesota, Herman Cain and Rand Paul. Paul chose a presidential setting for his speech this year, standing at a podium in a paneled office, the Washington Monument illuminated though a window behind him, flanked by the U.S. and Kentucky flags. His opening line: "Good evening. President Reagan said in the present crisis, government is not the solution to our problems; government is the problem." It wasn't the last Reagan quote. Paul's Libertarian message criticized Democrats and Republicans for "misdiagnosing" the recent recession and treating it with bailouts; blamed the Federal Reserve for the housing bubble; and pointed the finger at government writ large for failing to create jobs or alleviate poverty. "Government doesn't create jobs very well. Government is inherently bad at picking winners and losers," he said, proposing "economic freedom zones" where income and business taxes would be cut to a flat 5 percent. Mike Lee, who acted as Ted Cruz's lieutenant during the Texas senator's attempt to defund Obamacare, stayed on that message, referring to the president's health care law as "inequality Godzilla." Lee, like Paul a first-term senator with a Tea Party following, detailed ideas for how government can address income inequality with a "new conservative agenda," listing Florida Sen. Marco Rubio, Wisconsin Rep. Paul Ryan and Ohio Rep. Jim Jordan as examples of conservative reformers working on ways to help families escape poverty. "Hopefully our leaders, reformers and citizens will join the journey from Boston to Philadelphia — from protest to progress. Together we can march forward and take the road that leads to the kind of government we do want," Lee said. Carly Cody contributed to this report.